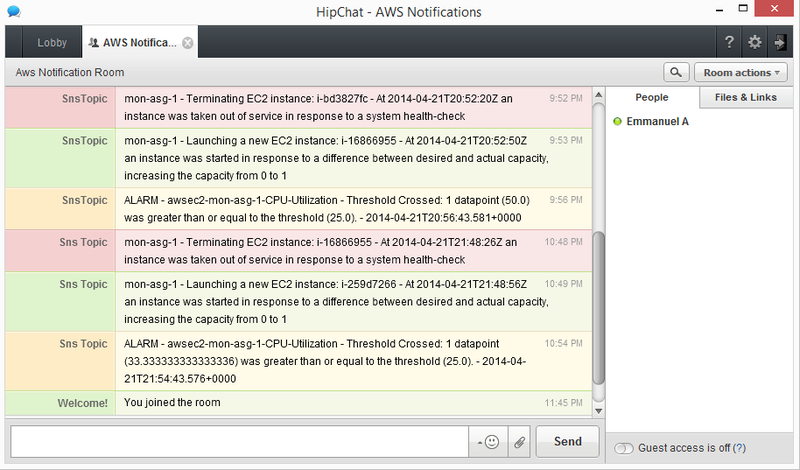 This entry was posted in AWS and tagged autoscaling, aws, hipchat, sinatra, sns by manny2k. Bookmark the permalink. I do not see how you sent back the subscribe url to confirm your subscription, how exactly did you go about doing this? Yes this looks fantastic, but I do have one question, in the readme it says to start the service I need to run this command from the terminal RACK_ENV=production ruby aws_sns_to_hipchat.rb -p , but I am using a chef knife plugin to spin up a datapipeline, I just want notifications to be sent on success or failure, how can I start the service from inside my ruby file? Hi Kevin, thanks for the comments! Assuming you’ve checked out the code to see how i auto-subscribe, so onto your second question. You can do several things to start the service, such as wrapping that command inside an upstart or init script, and have chef start the service before you spin up your data pipeline. Hope this helps!